"He's licking the glass and making obscene gestures with his hands." She pretty much only wears one outfit the entire movie. Her lines are not earth-shatteringly funny, particularly poignant or full of unheard depth. 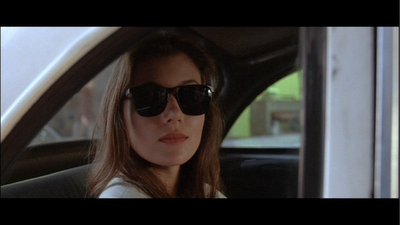 Sloane Peterson (Mia Sara) is probably one of my all-time girl crushes. She's cool, she's beautiful in a way that isn't wildly intimidating, and she rocks a white leather jacket with fringe harder than anyone in history. It's sort of funny that she hardly changes her clothes at all in the span of the film, but her look had a resounding effect on me. And it was pretty much this, "Damn, I want to be her." However, trying to emulate her look, as I might try to do with an Audrey film, simply isn't relevant here. 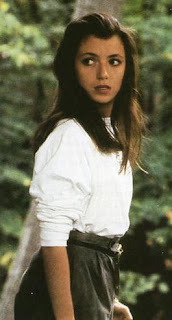 I wouldn't be caught dead in knee-high boots, bare legs and high-waisted, pleated shorts. Not on your life. What I take away from Sloane is more of an attitude. 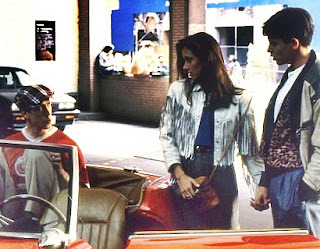 I remember watching Ferris Bueller's Day Off in high school, and totally identifying with the characters' "I care, but I don't really care," outlook on their lives and the future. Not to over-analyze, but think I can see that in Sloane's approach to dressing: it's representative of her grasp of trends, her brazen attitude and the fact that initially, it was just another school day. Oh, and her influence as the girlfriend of one Ferris Bueller. "I'd like to dedicate it to a young man who doesn't think he's seen anything good today - Cameron Frye, this one's for you." How badly do you want to watch the parade scene now? Thank you. This made my life.